Reverse osmosis is a filtration method that passes water through pores in a filter membrane that are so small, only the pure water water is able to get through. Other contaminates are physically too large and thus unable to pass through the pores of the system, so they do not enter in to the drinking water supply. Why is Reverse Osmosis Better than Bottled Water? Reverse Osmosis Systems are far more cost effective than bottled water and they don't rely on flavorings and additives. The water produced by a reverse osmosis system is generally cleaner than the bottled water offered in a store. 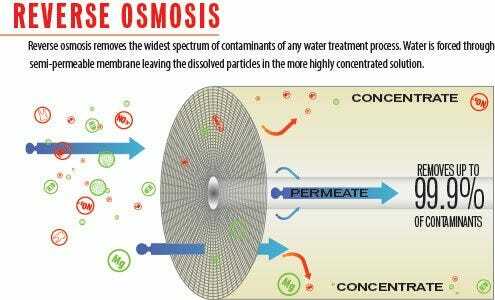 If you are looking for an alternative for your costly bottled water, a reverse osmosis system is the best option. How Often Do I Need to Change My RO's Filters? Most reverse osmosis filters need to be changed every six to twelve months. Though, depending on the quality of your registration system, such as a water softener or well water treatment system, you may be changing it more or less frequently. How Much is an RO System? US Water Systems is proud to offer top of the line reverse osmosis systems for under $200. These Apuapurion RO systems are built to last, and can be easily afforded on most family incomes. We also offer a wide range of filters for use with most RO systems. If you are looking to get your own reverse osmosis system installed, all of our systems come with easy to read instruction manuals, which make it a breeze for anyone who is relatively handy to quickly install a home reverse osmosis system. For those of you who are not plumbing inclined, any licensed plumber will be able to get your system installed without a hitch. US Water Systems stands behind every product we sell. We are so confident you will love any of our systems that we offer a 30 day money-back guarantee (ask for details). Reverse Osmosis, often called RO, is the best solution for providing quality drinking water, and is very effective for reducing a range of home water contaminants Partial List. Most RO systems include a sediment pre-filter that traps fine suspended materials which may clog the membrane, and a carbon pre-filter to remove chlorine and other contaminants that may damage RO membranes. A post carbon filter generally polishes the water. A RO system will dramatically improve the taste, color, and odor of the water. US Water is the source for all types of Reverse Osmosis Systems, Replacement Filters, Reverse Osmosis Membranes, Reverse Osmosis Installation Parts, Reverse Osmosis Accessories, and Designer Faucets for Reverse Osmosis Systems. With the largest selection of RO systems, highest quality NSF Certified Components, factory-direct-cut-out-the-middleman prices, and the best warranties in the industry, US WATER is simply the best solution. If you are not sure which system is best for you, one of our water specialists will be glad to assist you in deciding. Call us at 800-608-USWA or e-mail us at info@uswatersystems.com. Do You Know Which RO System is best for your Water Treatment Needs?